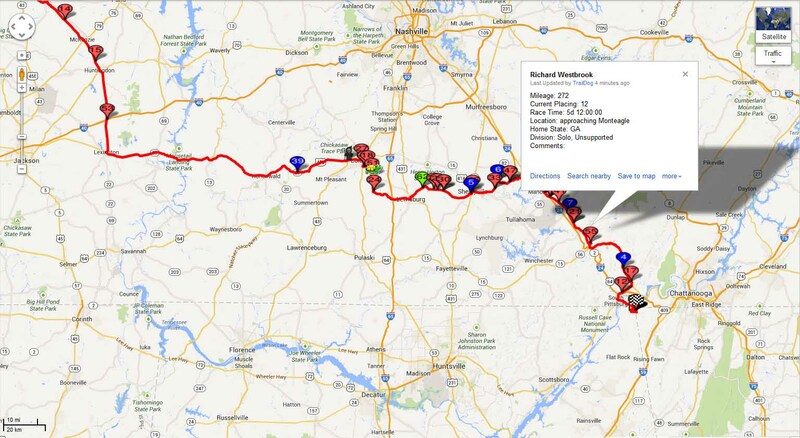 Richard was approximately 40 miles from the finish when he last called his wife and said he would spend all night on Monteagle, all up hill. He said he will be VERY disappointed if it’s more than 40 miles. He was around 275 miles into the race. 39 miles to go! He is 12th overall, 9th invidual runner, and 6th individual/unsupported runner. He hasn’t seen anyone on the course when Jan told him his place. He couldn’t believe it and said he thought he was around 28th place. Haha! He will probably run through the night and finish some time in the morning. That is good to hear since today the heat was horrendous for all the runners. Look for the new, and hopefully, final report in the am.